FC Guadalcanal featured a new coach on the bench in the form of Luke Eroi, former coach of Amicale of Vanuatu. His impact on the team was clear with FC Guadalcanal presenting a slightly different line up from their earlier ones and their passing worked much better. Marist, on the other hand, entered this clash with back to back wins and their Brazilian coach, Juliano Schmeling was looking to extend their winning streak. Excellent combination play from Robert Laua and Timothy Bakale led to the first goal for Marist after 35 minutes of play. 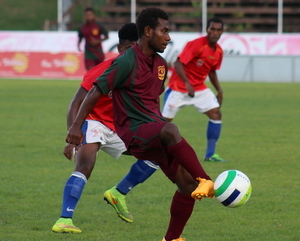 The ball was played in from the left and Laua held on to it long enough for Bakale to be free on his right before sending the through pass for the former Western United midfielder to score. FC Guadalcanal were unfazed by Marist taking the lead and stuck to their game plan, however, the first half ended without them scoring despite Paul Waisi going close on two occasions. The second half was electrifying as tempers flared and the referee and his assistants were called to action several times to keep the peace inside the pitch. Several yellow cards were also shown by Nelson Sogo to regain authority. FC Guadalcanal grabbed the equaliser ten minutes after the break with substitute Frank Pady crossing for Alford Po’oia to finish with a spectacular header destined for the far post with Phillip Mango ill-positioned to do anything about. Marist, however, reclaimed their advantage after Leslie Ramo was fouled in the FC Guadalcanal box. Bakale slotted the spot kick home to close the game with all three points going his club’s way.